After our adventures in Uruguay we were due to start our South America tour in Buenos Aires. We arrived on the ferry from Colonia about 5pm so had about an hour or so till we had to meet our new travelling companions and check in to the hotel. The hotel wasn’t far from the dock and we checked in and discovered that our tour was 18 people strong (the maximum) plus our guide (or CEO- chief experience officer). The meeting started in the bar and we met our CEO Nicolas, who was Chilean. Our tour was a YOLO (you only live once) which meant the age was capped at 35. Most were in their 20s with a few 18/19 year olds: 11 girls and 7 guys. After Nicolas explained the tour we went for dinner around the corner. Not everyone came as some had made other plans but it was good to chat to some of our new travelling mates. We had a decent steak sandwich and chips and some beer. Some went out clubbing after but we decided to get some sleep. 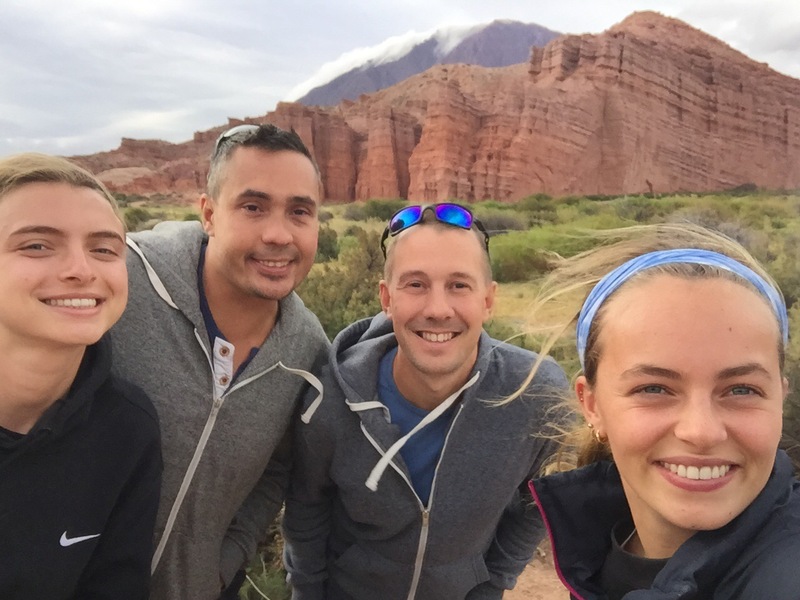 The following day we were up early to fly to Salta in northern Argentina. The flight was slightly delayed but we arrived in the early afternoon. We transferred to the hotel and went out for an orientation walk around the town. 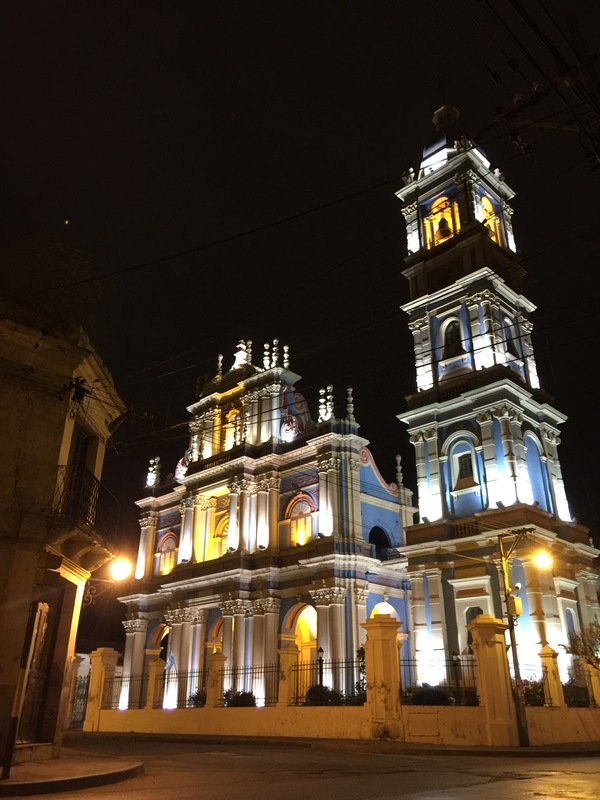 Apart from the main square Salta doesn’t have much to offer apart from a museum and some very colourful Catholic Churches. One close to our hotel was blue and yellow and had a large bell tower. In the main square there were some impressive buildings. The main church was pink and light yellow and stood over the plaza. It was also the national independence holiday so there were lots of people marching with the blue and white Argentinian flag and banging drums. We stopped to have some local ‘epinades’ a sort of small pasty filled with either: meat, chicken or cheese. They were very tasty and we washed them down with a beer. After we got some cash and made our way back to the hotel. 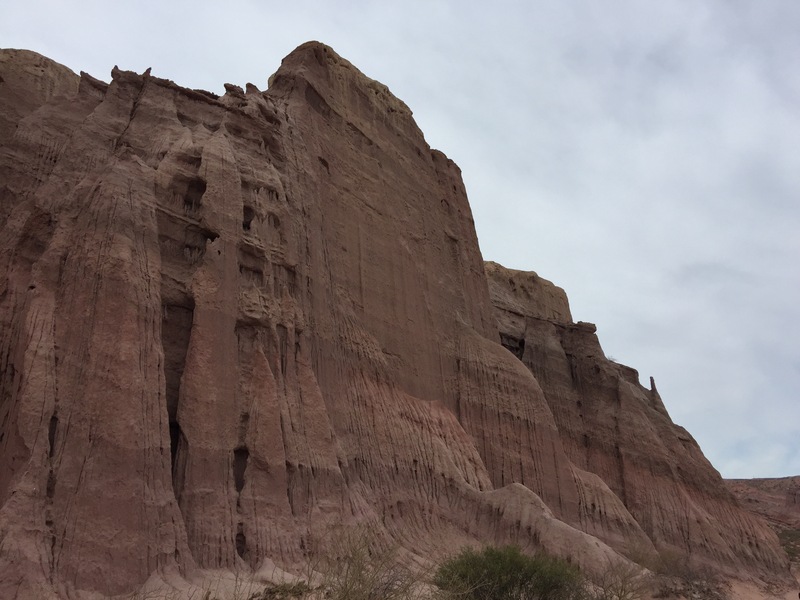 We booked for the following day a trip to Quebrada de las Conchas / Cafayate, some impressive rock formations and town. The bus arrived early at 7:30am and we got on with 2 others from our group: Eliza and Emma-Kate. It was a long 2 and half hour drive but we slept most of the way. We entered the national park area and were struck by the strange Martian like landscape. Beautiful red mountains, gorges and valleys. All several hundred thousands to millions of years old. The layers of the rock were strikingly apparent, and also contained layers of sea shells were the rock was once at the bottom of the ocean. Most formed by ancient volcanoes and the crust pushing upwards from tectonic activity, the pressure the rocks were under had created these strange layered rocks. Our first stop was the ‘devils throat’ a formation that had made a throat shaped circular canyon. After snapping pictures Mike flew the drone to get a real sense from above of the formation. What also became clear were the huge Andes Mountains behind covered in cloud. Next we drove 2 minutes around the corner to the ‘amphitheater’. This was a complete circular formation again providing good photo opportunities: even complete with a musician playing local Spanish songs and at one point the national anthem which everyone joined in with! Again Mike flew the drone to get the real perspective. Next we stopped in a place where the layered rocks were in colours: reds, blues, greens and yellows shone out in layers. Hard to capture in a photo but the drone did a far better job. These were the pictures we had been waiting for and had researched and seen. Although we didn’t stop for long so it was only a quick flight. A shame as there was so much more to capture. Fifteen more minutes through the valleys and Martian landscape we stopped for another photo opportunity of red rocks where their layers were vertical rather than horizontal, the weather had eroded them in strange ways. What was also impressive was the empty road winding its way through the red landscape. Unexpectedly we stopped next for a wine tasting tour. The area is also famous for its high altitude vineyards at over 1700m. We stopped at a large white building on the side of the road were a local Argentinian awaited to tell us all about (in Spanish) his families vineyard. We sampled 4 wines, 2 white 2 red. One white we bought a bottle as it was only 100 peso or £5! All the wines were good and Eliza and Emma-Kate also bought some. Finally we reached the town of Cafayate. A small town with a beautiful central square. We ate some epinadas for lunch and had some more wine in the sun, enjoying the company of Eliza and Emma-Kate before looking around the market and shops. We purchased some gloves and hat for the cold weather that we would be soon experiencing, as well as some gifts for people back home. After taking some pictures of the church and square we loaded back on the bus for the 3 and half hour drive back to Salta. 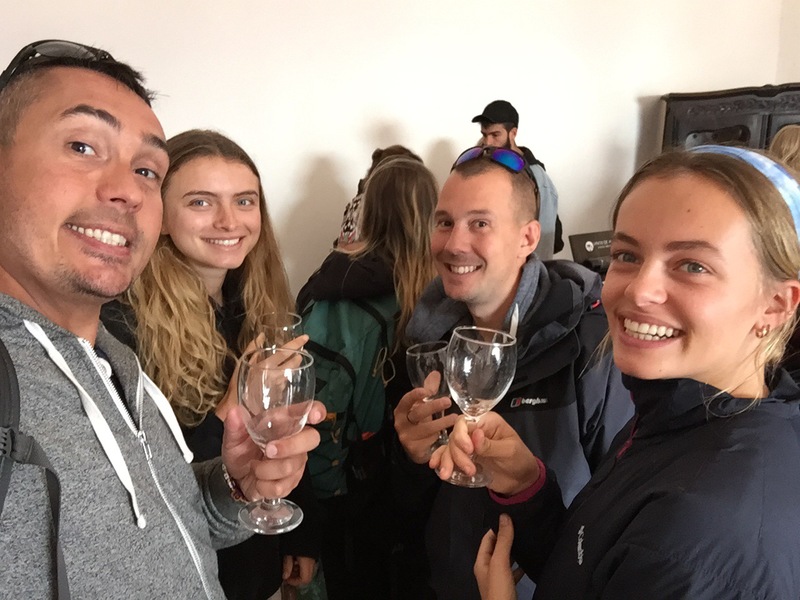 We arrived back to some bad news however: our boarder crossing into Chile and the Attacama desert across the Andes for the following day was closed due to bad weather. We now had another day in Salta at least and possibly might miss out on the Atacama altogether.